We left Munich late Friday afternoon and drove to see Frieda's sister Agnes. Agnes lives near Passau, a river city on the Danube in Lower Bavaria. Passau was an ancient Roman colony of ancient Noricum called Batavis, Latin for "for the Batavi". The Batavi were an ancient Germanic tribe mentioned often by classical authors. During the Renaissance and early modern period, Passau was one of the most prolific centers of sword and bladed weapon manufacture in Germany. Passau smiths stamped their blades with the Passau wolf, usually a rather simplified rendering of the wolf on the city's coat-of-arms. Superstitious warriors believed that the Passau wolf conferred invulnerability on the blade's bearer, and thus Passau swords acquired a great premium. As a result, the whole practice of placing magical charms on swords to protect the wearers came to be known for a time as "Passau art." 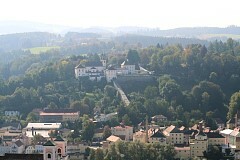 We took the Autobahn to Passau, then drove to the small village outside Passau named Straßkirchen. 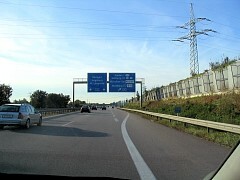 Despite the widespread belief of complete freedom from speed limits, some speed regulations can be found on the Autobahns. Many sections do indeed have posted limits ranging from 80 to 120 km/h (50-75 mph), particularly those with dangerous curves, in urban areas, near major interchanges, or with unusually constant heavy traffic. Some sections now feature nighttime and wet-weather speed restrictions, and trucks are always regulated. 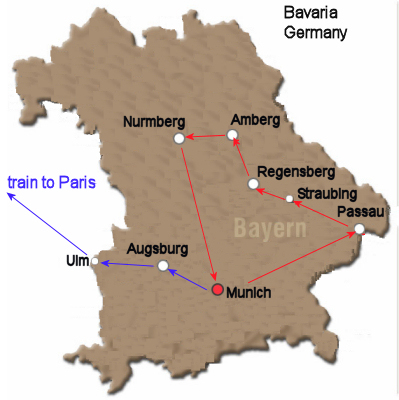 Still, about half the Autobahn system has no speed limit, but there is always an advisory limit of 130 km/h (81 mph). We arrived after dark and met up with Agnes in the Gutsbräu Straßkirchen. Here is a (bad) photograph I took of the vaulted ceiling inside the tavern/restaurant. They brew beer here, and have extensive underground cellars from when the operation was much larger. 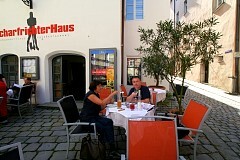 They make a Helles beer (pale malt lager) that, along with the food, I thought was great. German beer must be made from just four ingredients to be labelled as such - malt, hops, yeast and water. We returned to Agnes' nearby home and stayed up late drinking wine and some very old, smooth schnapps. 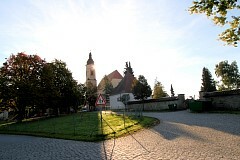 The church and village is called Straßkirchen or Strasskirchen, possibly meaning "Paste Church". From what I can piece together, since 1674 (with a short interruption prior to 2000) the local church has had a brewery associated with it. 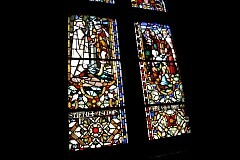 Originally there was surrounding farmland also associated with the church, but that has been sold off. 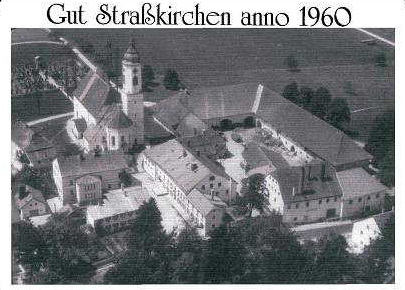 As you can see from the pictures below, some of the church buildings have been torn down in the last 50 years. You can enlarge the pictures below to see some views of what remains of the church outbuildings. Just a morning photograph looking east showing the countryside surrounding Straßkirchen. Here are my cousins - our grandfathers were brothers and grew up on the same farm near Straubing. I also got to meet Agnes' son Daniel. 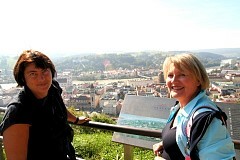 In the background is Passau. In the map below, we are approximately where the white "X" is. 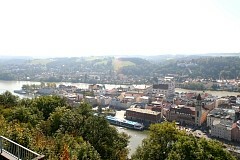 Passau has a population of around 50,000 people, and another 8,000 when university is active. 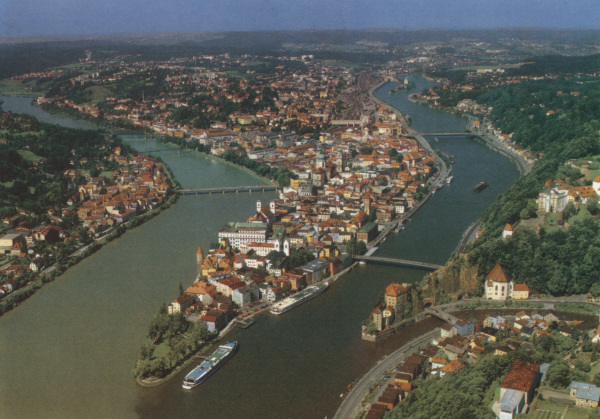 Passau is near the Austrian border and is known as the City of the Three Rivers (Drei-Flusse-Stadt). The rivers are the Danube, Inn and Ilz. The black circle encloses the area where the rivers flow together. The water in each river has a different color. The source of Inn river is located in the Swiss Alps, near St. Moritz. The river is called the "En" in Switzerland. 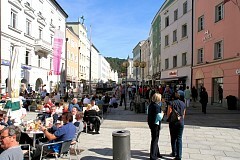 It runs through the Austrian state of Tyrol and its capital, Innsbruck (Bridge Over the Inn). This is an overhead view of the same area. Note again that each of the three input rivers has a different distinctive color. 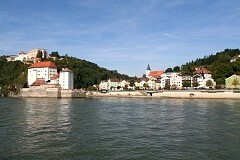 Because of it's location on a sliver of land between two rivers, Passau is prone to flooding. 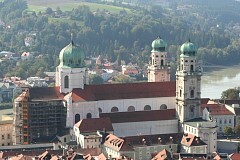 (Enlarge this picture) The large two-domed cathedral under repair on the right is St. Stephan, the smaller Heiligenkreuzkirche abbey church with two square towers is on the left. 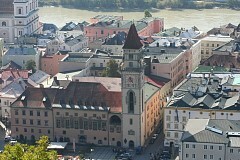 In the left foreground is the Altes Rathaus (Old Town Hall), and the small white complex toward the left across the river is Wallfahrtskirche Mariahilf. 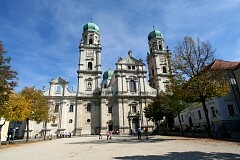 The Wallfahrtskirche Mariahilf is an abbey complex and church built between 1627-30. The buildings are Baroque in style. The covered walkway houses 321 steps which pilgrims climb one by one, stopping to pray at each one, until they reach the sanctuary. 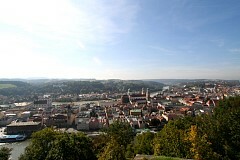 This view shows the pointed end of the city of Passau. Seasonal rains cause regular floods during autumn and winter. 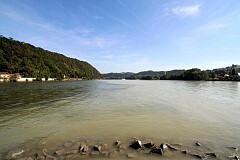 The northern tributaries of the Danube from the plains and low mountain ranges carry increased water volumes and cause floods in Passau. During summer the southern tributaries of the Danube cause regular floods due to the alpine thaw. These regular high water levels are predictable and don't normally cause much damage. Disastrous floods like the one in the summer of 2002, occur when both components work together: heavy rain in addition to the alpine thaw. One of the most striking is cathedral of St. Stephan, which boasts the world’s biggest church organ. It's done in the Baroque style. There has been a church on this spot since the 5th century. The interior was designed by Italian artists, notably Carlo Lurago and the stucco master Giovanni Carlone. The frescoes show scenes of heaven, but the most impressive item in the cathedral is the organ with a staggering 17,974 pipes. Organ concerts are given regularly. Here is the Old Town Hall, with what will turn out to be a wedding party out in front. We are down in the city now. We drove a car: and the parking was scarce. Like a lot of German cities the old city center doesn't allow cars. It has been said that Passau has the feel of an northern Italian city. We walked along the Danube to get a look at where the small Ilz river joins the Danube. This boat blocked the view. We asked permission to go aboard to get a better vantage for photography, and permission was granted. The picture on the left shows the Ilz, the picture on the right shows some of the ancient fortifications of the town. Leaving the boat I took this picture of these bicycles stowed onboard. 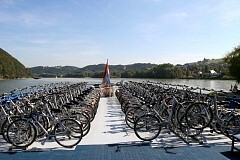 There is a well known bike trail leaving from Passau and going right to Vienna. 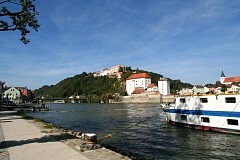 Most of tourists Passau receives are on river cruises going along the Danube. We are at the point of land at the end of Passau. 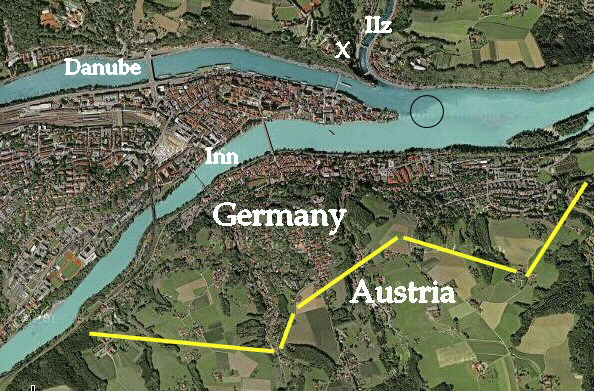 Although the Inn has a greater average flow than the Danube when they converge in Passau, the Inn is considered a tributary of the Danube, which has a longer length, drains a larger surface area, and has a more consistent flow. 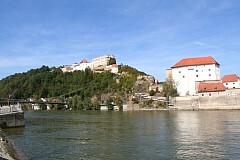 Note that the color of the Inn (right) differs from that of the Danube (left). 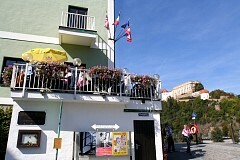 Folks enjoying breakfast from the balcony of a restaurant. The old center is distinctly Italian, with winding medieval lanes, tunnels and archways. 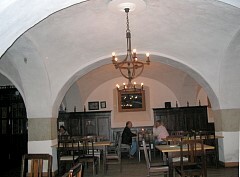 We had some wine and a little something to eat here at the Scharfrichterhaus (executioner’s house). I tried Schweinschmalz (pig fat) on bread. The Scharfrichterhaus was the official residence for the Scharfrichter (executioner) of the city of Passau. It is now an important jazz and cabaret stage on which political cabaret is performed. 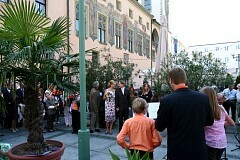 Now we pass the wedding party outside the Old City Hall. I don't remember where this is taken, but as you can see we had the place to ourselves. Agnes and I disappear up a narrow street. Over the centuries how many people have made this same walk up the cobblestones? This is in St. Stephan Cathedral. The cathedral boasts one of the largest organs in the world. There are actually several organs, and through mechanics the organist can play them all remotely. The organist can even play them all at once, although that is not done full bore because of the fear of structural damage! The front of St. Stephan Cathedral.